Luna Journal is your essential go-to-guide to the German as well as the international “Babies, Kids & Maternity” market places. Luna Journal is an independent specialist title with high editorial value. It sees itself as an informer, curator and reflector. Here insiders have their say and report on the current market from all major arenas to behind-the-scenes. Luna Journal reporting is always razor-sharp and passionate. It is your guiding light through the hustle and bustle of day-to-day business. Luna Journal tells inspiring stories and opens up new perspectives. Luna Journal reports on market-relevant topics. We know what we like: stories about brave visionaries whose ideas are changing the market. Individual voices are heard through in-depth portraits and interviews with market insiders and opinion leaders, company-, store- and brand-features provide insight and number crunching rounds-off the facts. Obviously Luna Journal also offers bespoke fashion spreads and editorials, trend reports from key trade fairs, and need-to-know market and product news from around the globe. 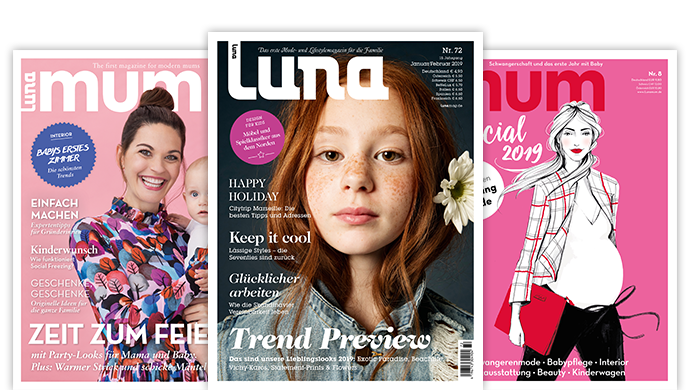 Luna Journal’s core readership is made up of national and international owners, buyers and shop managers operating in the specialised retail and E-commerce trade. Furthermore, our readership includes decision makers, opinion leaders, manufacturers, importers, wholesalers, suppliers, distribution-, marketing, PR- and advertising-industry reps, as well as designers, stylists, photographers, bloggers, fashion- and business journalists. Luna Journal is published by Luna media Group. The publishing house has successfully established itself in the fascinating brand and product world of “Babies, Kids & Maternity” through their portfolio encompassing Luna, Luna mum, Luna mum Special. Luna media‘s diverse portfolio makes it a highly regarded partner for all relevant international fashion trade fairs such as Pitti Immagine Bimbo, Playtime, CIFF Kids, kleine fabriek, Bubble and a lot more.